A variety of free printable preschool writing patterns to help develop writing skills. Use these writing pattern worksheets to encourage your young preschoolers to write across a page from left to right, while developing their fine motor skills at the same time. Young children should use thick wax crayons, thick triangular pencils or felt-tipped markers, which are easy for their little fingers to grip. Always ensure that they are gripping the writing tool correctly as a bad grip is hard to correct later. Once the children have completed each pattern row, you could show them how to decorate them - for example, with the zig-zag pattern, add ice-creams with cherries on top or draw a face underneath a pointed hat for each zig-zag. Teach left-handed children to write and color correctly from the start and avoid having to correct bad writing habits later. 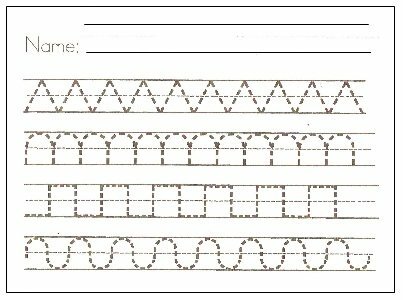 Click on the image below to download the pdf file containing the writing patterns. You will need to have Adobe Reader installed in order to read the file. This page lists various printable alphabet pages, writing patterns, numbers, printable math activities, coloring pages, Bible memory verses and more! These is a list of free printable bible coloring pictures to accompany children's Bible stories and children's Bible lessons. These pages contain the numbers 1-10 to trace and copy. There is also a blank lined page for extra practice in the set of printables.